Join us for an interactive Metro Rail Transit Oriented Development (TOD) workshop. 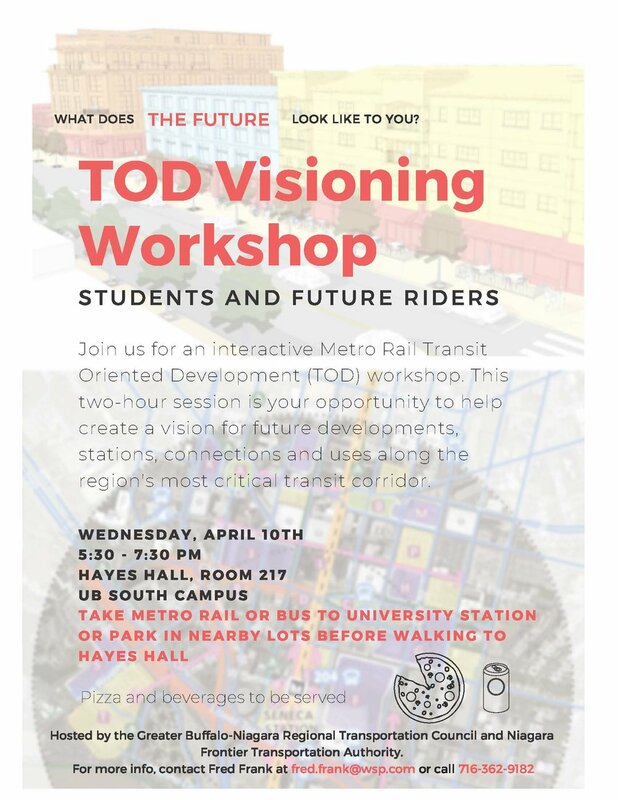 This two-hour session is your opportunity to help create a vision for future developments, stations, connections and uses along the region’s most critical transit corridor. On August 29th, the vision for Transit-Oriented Development in the Buffalo-Niagara Region was presented at an Open House for community members to review the information and display boards and to offer feedback. The final round of TOD workshops focused on neighborhood planning around several Metro Rail Stations. These workshops offered the opportunity for community members, government officials, developers, businesses, and not-for-profits to come together to plan for the future of the following Metro Rail station areas: Audubon, Boulevard Mall, LaSalle, Utica, Summer-Best, and DL+W. The first round of Transit-Oriented Development workshops held at Seneca One Tower earlier this year were a huge success and brought about great interest in promoting regional growth and development around Metro Rail. On June 28th, 2017 the second round of Transit-Oriented Development workshops were held at Hayes Hall at the University at Buffalo South Campus. The purpose of the meeting was to share which existing and future Metro Rail station areas are viewed as having the best Transit-Oriented Development potential and participate in an engaging planning exercise to ready these station areas for Transit-Oriented Development. On March 29th, 2017 the Greater Buffalo-Niagara Regional Transportation Council (GBNRTC) held a Transit-Oriented Development (TOD) Workshop at Seneca One Tower. This is the first of several such workshops that will take place over the coming year. The purpose of the workshop was to join the public with regional stakeholders and Transit-Oriented Development experts from across the country. At the workshop, attendees shared their knowledge and ideas to help inform a plan being developed by NFTA and the GBNRTC. On this page you can view a summary of the input gathered from participants at the workshop, along with photos and presentations from the workshop. This document summarizes the input received from participants at TOD Workshop #1 held on Wednesday, March 29th, 2017 at One Seneca Tower. Listed below are the presentations from TOD Workshop #1 held on Wednesday, March 29th, 2017 at Seneca One Tower. Click on the title or image to open a PDF version of the corresponding presentation.